Peas don’t get enough respect. The simple little spears can offer a pop of color and fresh flavor to any meal, especially this time of year. What’s not to love? Brian and I recently whipped up this simple side for a recent dinner party and have been craving more of it for the last few weeks. Make some and see for yourself! 1. Cook the bacon in a large sauté pan over medium heat. Set aside to cool. 2. Meanwhile, fill a large pot with water and bring to a boil. Add the snow peas and snap peas and cook for 2 minutes. Add the frozen peas and cook for 1 minute more. Transfer all three to an ice water bath to stop the cooking process and set aside to cool. 3. In a medium bowl, whisk together the buttermilk, olive oil, mayonnaise and lemon juice until well combined. Add the lemon zest, parsley and salt. Taste and adjust ingredients accordingly. 4. Toss peas in dressing and top with cooked bacon. 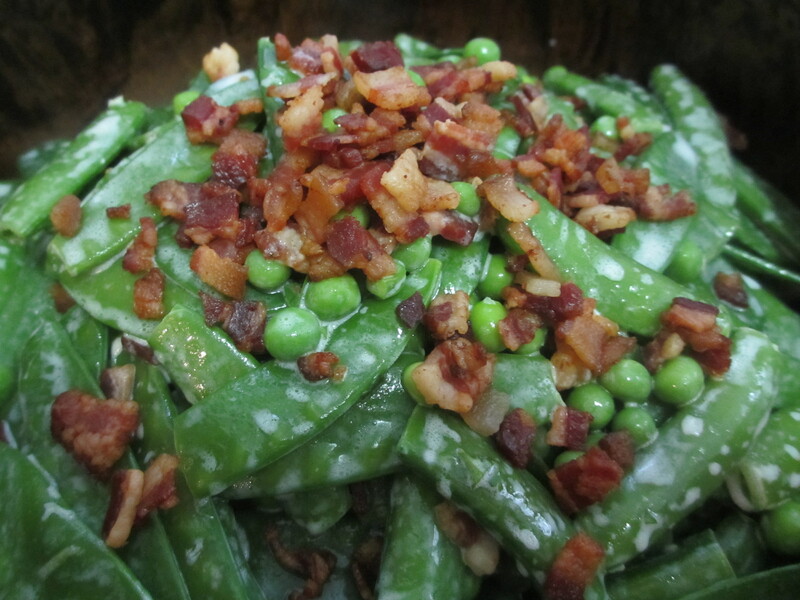 This entry was posted in In the Kitchen and tagged @SWWUblog, bacon recipe, buttermilk dressing, food, in the kitchen, pea, quick and delish, recipe, simple side, snow pea, sugar snap pea by Something We Whipped Up. Bookmark the permalink.